Hot Toys will be releasing this awesome Limited Edition IRON MAN 2 Hall of Armor Diorama in May 2013. 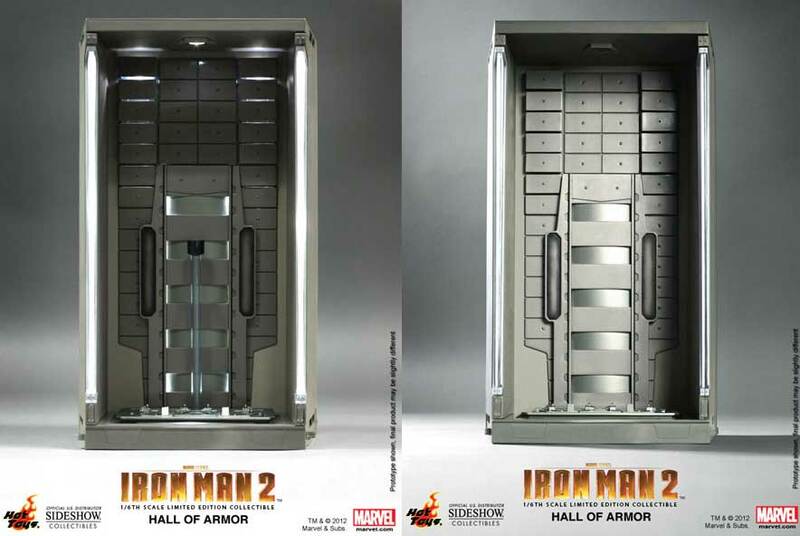 The Hall of Armor recreates Tony Stark’s home workshop from director Jon Favreau’s 2010 film Iron Man 2. This is a movie accurate diorama with four authentic and highly detailed Hall of Armor sections. Measures Approximately 13.5 inches H x 9 inches W x 6.75 inches. This will set you back $469.99, or $94 per month if you take a Sideshow payment plan. Note that you don’t have to buy this as a set of four. 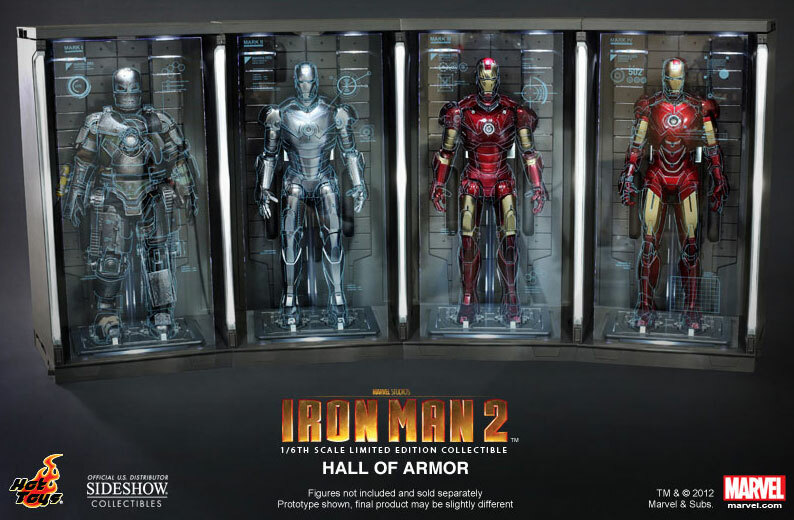 You can also get an Individual Hall of Armor Section for $129.99 or a Complete Hall of Armor Seven Set for $799.99. High quality replica of the Death Trooper helmet from ROGUE ONE: A STAR WARS STORY. A highly detailed, highly limited 1:1 scale replica of the classic Chestburster! Produced via collaboration with Weta and Jens Hansen Gold & Silversmith. A limited item officially sold out but still available from certain vendors. Available for pre-order in time for its September 2013 release. All sold out, but you can still buy one from a re-seller. Pack of 3 Pacific Rim action figures from NECA. Opportunity to get 1 of only 55! PACIFIC RIM Kaiju Knifehead Statue Can Be Pre-Ordered Now! The first of the Kaiju statues comes courtesy of Sideshow Collectibles! Incredibly detailed piece. Possibly a limited edition item. Limited edition of only 5,000 units. The 200th Hot Toys Movie Masterpiece Figure! Coming August 2013, pre-order now! Limited edition of 2,500 and rare. Limited edition dependent on how many sell in a timed period! Limited to only 225 printings. Coming from Diamond Select in November 2013! Limited to only 500 pieces. Get a glimpse at their new Man of Steel premium format figure!